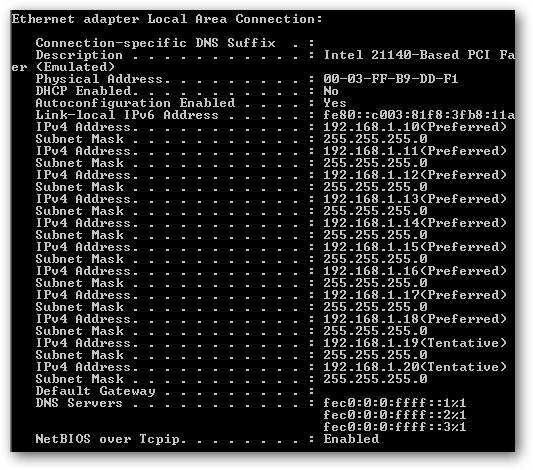 If you have ever added multiple IP addresses to a single Windows server, going through the graphical interface is an incredible pain as each IP must be added manually, each in a new dialog box. Here’s a simple solution. Needless to say, this can be incredibly monotonous and time consuming if you are adding more than a few IP addresses. Thankfully, there is a much easier way which allows you to add an entire subnet (or more) in seconds. 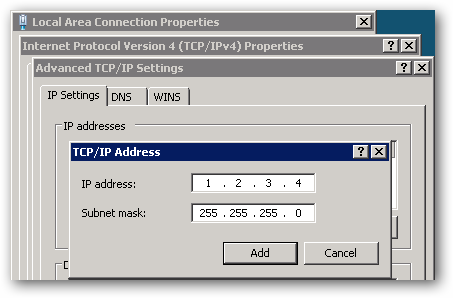 Note: For Windows Server 2003/XP and earlier, “ipv4” should be replaced with just “ip” in the netsh command. The above command adds the IP Address 192.168.1.2 (with Subnet Mask 255.255.255.0) to the connection titled “Local Area Network”. This command takes about 20 seconds to run, where adding the same number of IP addresses manually would take significantly longer.